A poem of mixed emotions and overcoming ultimate feats. But those whom he asked were lost, too. Sitting down again, he cried into his lap. There was one who heard him. And on his refusal she was off again. He stayed on the ground praying for sound. She sat for a while, crying and catching her breath. And noticed a sun in the sky. She looked and meandered and wondered why. I can’t reach it by myself. And found him still on the ground. His eyes looked up with such pain and sorrow. “We can reach it, I know! It vanished a moment later. She looked at him then turned away. And all within him shattered. 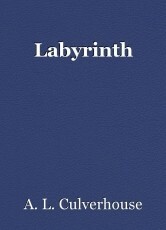 Through the mazes of the Labyrinth. And she ran for the horizon to catch it. She caught it with both hands. She sat with her arms clamped around it. And sat with the shadows engulfing him. Murmuring words to the Forbidden. Cowering for help from another. But you have to catch it.